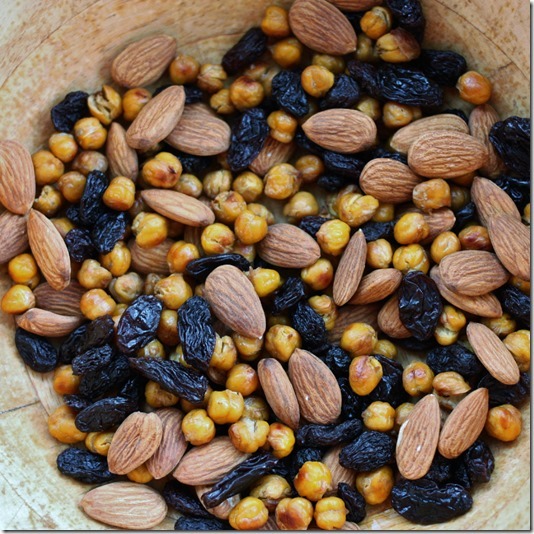 My Favorite Snack: Almonds, Roast Chickpeas, and Raisins. Simple Vegan Eats. In my new life (is it still my “new” life? It still feels that way…) as a perpetual student, I’m always on the hunt for new snack ideas. I spent the first year of my post-bacc living off of snack bars and apples. 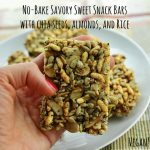 I still love bars and fruit as snack food, and certainly they’re the snacks that are easiest for me to find anyplace I go, but I also love savory snacks, veggie-ful snacks, and unconventional snacks. My favorite snacks of all are those that are both a little savory and a little sweet (because savory/sweet combos are my jam). 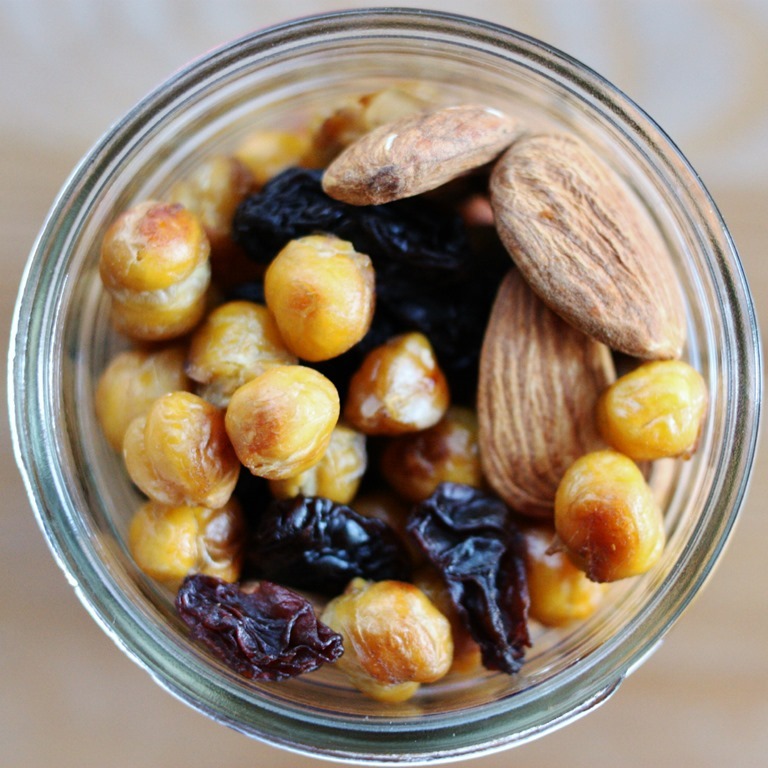 Today’s snack—a really simple mix of nuts, roasted chickpeas, and raisins—is both savory and sweet, and it also gets points for being incredibly easy to prepare, easy to transport, healthy, and satisfying. In short, it rocks my world. The last time I featured roasted chickpeas, it was in my tortillas with creamy kale and toasted chickpeas, but I eat them all the time. Sometimes I make a big batch of them over the weekend and devour it as the week goes along. Roasted chickpeas are so versatile: you can enjoy them in salads, stir fries, on top of soups, or all on their own. You can flavor them with whatever combinations suit you. And they’re great sources of protein and fiber. Sometimes I dehydrate them after I roast them for an hour or two; this makes them especially crunchy. You can vary those proportions as you like, and you can double or triple the batch as needed. For me, this yields four snack servings or so. Mix all ingredients and bake in an oven set to 375 for about 35 minutes, moving the chickpeas around with a spoon halfway through. You want them to get nice and brown! After you’re done roasting the chickpeas (and dehydrating, if you wish), simply mix them with the almonds and the raisins. And voila! A perfect snack. 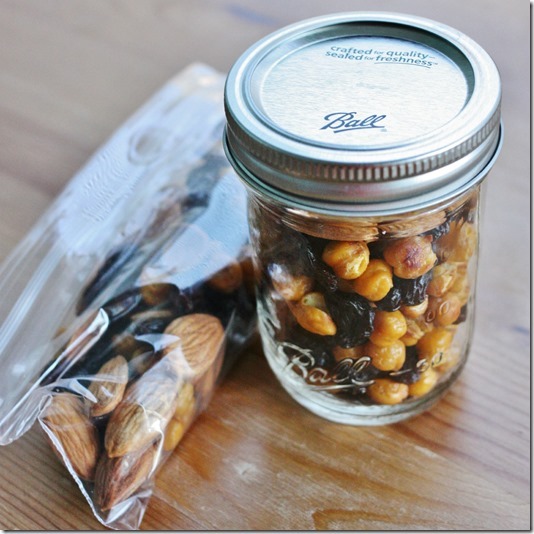 You can pack it up in mason jars or in snack bags. I store mine in the fridge to be safe, and it lasts four days at least (longer if I dehydrate the chickpeas after roasting). This snack appeals to me because it has a little bit of everything. It’s a little salty and a little savory. It’s got protein (nuts + beans), healthy fat (nuts + oil), simple sugars (raisins), and complex carbs (beans). It keeps me satisfied for a while, in part because it’s so well rounded in terms of taste, texture, and nutrients. And once the chickpeas are roasted, there’s no real prep involved! I hope you’ll give it a try. I’ve only been making it with the combo shown, but I bet you could experiment with a lot of different legumes, nuts, and dried fruits. I may need to revisit the idea and show you some more variations. With that, I’m signing off. Today I woke up, jogged a little in the sun, went to the farmers’ market, and have spent the rest of the day with friends (and more friend time later tonight). It feels very luxurious, but it’s been almost two years since I had a Sunday like this, and I just had to share my gratitude for it with you all. 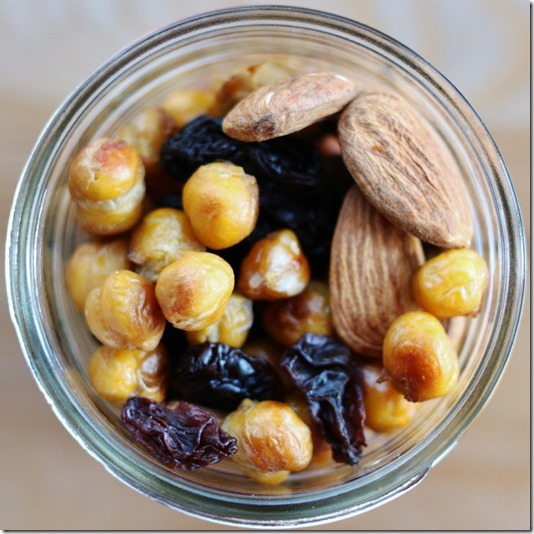 I don’t know why I’ve never combined roasted chickpeas with nuts and dried fruit…it sounds amazing! I love that sweet/savory combo and all of the different textures. Enjoy your much-deserved time relaxing! Genius award! 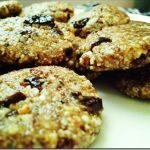 The dried fruit-and-nut combo always benefits from another element. This one never occurred to me, but I’m thrilled you thought of it. This is such a fun snack idea. Please post more recipes like this! Great idea! I LOVE roasted chickpeas on-the-go, but I usually eat them on their own. Excited to try this post-FODMAPs! Sounds delish — I’m guessing you roast cooked chickpeas right? I am in love. I’ve been on the hunt for a new snack, and I find prepared snacks from the store are too high in sodium. Thank you! That’s great to hear that you’re able to get out and enjoy yourself without feeling bogged down by books and exams. 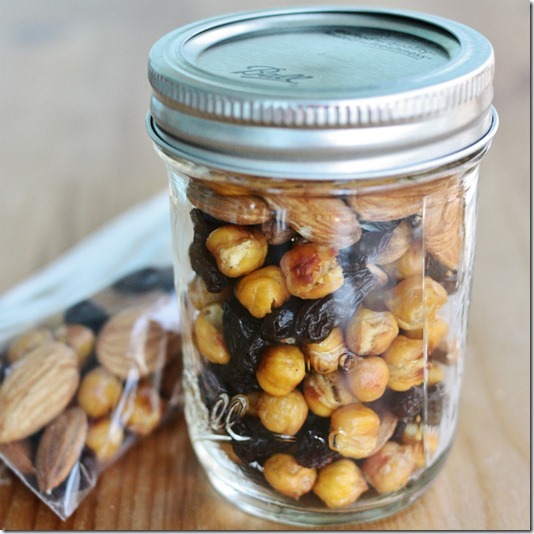 I love this snack idea, and I have a feeling I’ll be bringing it with me to my new job! I’m always up for new savory snack ideas, so thanks, but I’m way more thrilled to hear about your Sunday off! I can’t think of anyone who deserves it more. Oh, I love this idea! I totally agree with you about savory/sweet combos – they’re the best! I am definitely trying this, but instead of almonds, I’m going to use roasted pistachios and maybe add some cinnamon and smoked paprika to the roasted chickpeas. Sounds good! Can’t go wrong with either pistachios or paprika. Beautiful! And I am so happy to hear that you had a rest filled Sunday, you certainly deserve it! 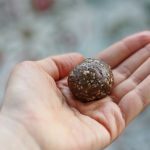 This is pretty close to my basic snack – a handful of raw almonds with about 5 prunes. Such a delicious and nutritious and filling combo. I’ve never had success roasting chickpeas, but you’ve inspired to me to try again! This sounds perfect paired with a bag of golden berries that I just bought (a bit of a splurge). Thanks for the idea! Great idea! Sounds so delicious! I would try it soon. Thank you for your post. And I am very happy to hear that you had a rest filled Sunday. I hope I would have some opportunity to have a rest soon. Yum…this sounds like a perfect snack blend! Simplicity is my mantra when it comes to snack prep; hummus and veggies is about as ‘complicated’ as it gets. Must whip up a batch tonight. So glad you had yourself a good old fashioned Sunday…so necessary for replenishing one’s spirit no matter what stage we happen to be at in our lives. There’s nothing like stepping outside of one’s insular world for gaining a realistic perspective. Yay for great friends! I love roasted chickpeas! I eat mine on salads and in wraps. 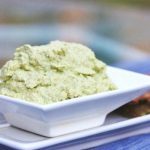 What would happen if you blended up a whole avocado and then smooshed it all over chickpeas (or anything you wanted to roast) and then roasted it? Also, what would happen if you made nut butter and then smooshed it all over chickpeas (or like, vegetables) and then roasted it? Love this chickpea trail mixology, also. By the way. In addition. As well. Something about roasting an avocado just feels wrong to me. But nut butter? I think what would happen is instant gratification. It’s been done, apparently with success! What a fabulous idea! This and your savory snack bars… pure genius. I am trying to decrease the amount of grains these days, so this is a perfect little snack that is sure to have some staying power. Loving this Gena! I absolutely love this idea. Thanks for sharing! Sounds simple and delicious. 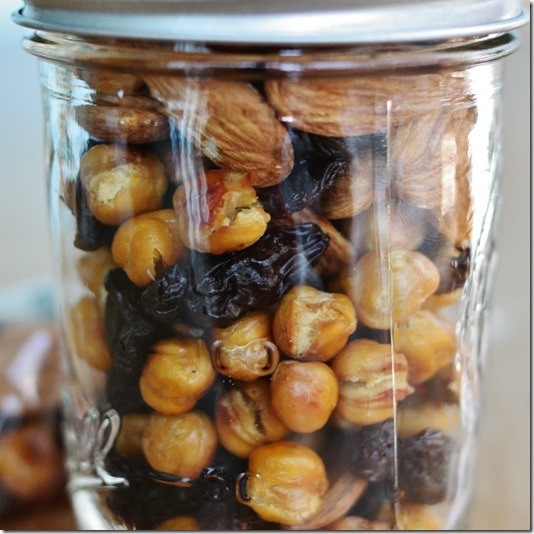 I love the combo of nuts and raisins, and in fact, I might start adding this to my snack routine. Just wanted you to know there is BPA is the lids of mason jars! You can buy lids for them on amazon for like 4.00 for 8 of them. We use mason jars for a lot and just found this out recently. Do you know how long roasted chickpeas are good for? do you keep them in the fridge? thanks, this looks really good. I do store them in the fridge, yes. I’d say 4 days, for sure. This is a fabulous and simple snack — Thank You. Before I go and attempt to reinvent the wheel, have you tried roasting any other beans? Or are garbanzo’s the only type to crunch this way? so I soaked some garbanzos to sprout them which they did. Can you use sprouted beans in this recipe? Should I cook the beans before I roast them or can you just roast them after sprouting? TIA 🙂 Looking forward to snacking on this! What a wonderful blend. Roasted chickpeas are delicious. This is a great snack , I love the different textures. This looks like my digestive system’s hell. I can’t do these bean and nut recipes and honestly, I don’t think a lot of people can. Most people I know who I’ve watched eat things like this tend to complain of stomach aches afterward, and I never discuss these things with them and they’re not into health like I am. I always am wondering why you post them, as a dietitian–I guess you must know a lot of people who can digest these things well. I’m going into dietetics currently, and that’s one of the things I won’t advise people unless I know their digestion is great and they have a really hard time being full. Looks delicious though. I’m a little baffled by your comment, to be honest! As a nutritionist, I consider it practically a responsibility to encourage people to eat more legumes and nuts. Both are some of the most nutrient dense recipes around — legumes are rich sources of protein, calcium, iron, and complex carbs, and nuts/seeds are wonderful sources of healthy fats. While beans take some digestive adjustment if one isn’t used to it, many people can ease into eating more of them with time. And I’m not sure it’s fair to say that not a lot of people can eat them; legumes are a foundation food in many cultures/nations (India, the Americas, China, the Middle East, the Mediterranean — it goes on). Plus, both nuts and legumes are correlated with a lower risk of heart disease. I’m actually surprised that dietetics training hasn’t given you cause to celebrate them, given how nutritious they are! Of course, every body is very different, and it’s great that you’ve identified what doesn’t work for you. And indeed, anyone who cannot digest them should of course be mindful. Soaking beans, increasing consumption gradually, and adding acid to them after cooking can all be helpful. 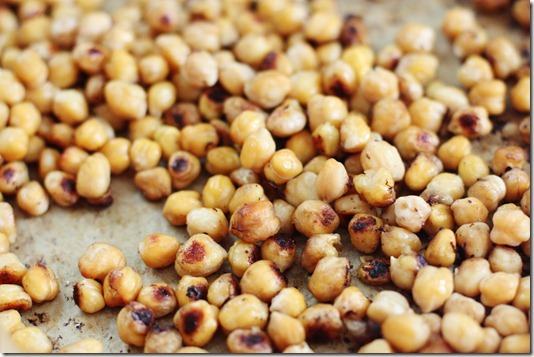 I love the idea of dehydrating the chickpeas for longer shelf life. How long would you dehydrate them? I have one of those round dehydrators where the temp cannot be controlled. I appreciate simple things like this. I live in the DC area too and true to form in this area have an hour commute while also being a pt grad student and raising my four children and occasionally saying hello to my husband. Thank you for your simple idea. Love ones that can be packed for lunch – sometimes I am packing my lunch and dinner for the day. 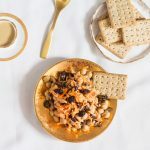 Can you use canned chickpeas for this or do you have to cook your own? sometimes, the simple things are best! Yummy! It means you use a dehydrator – google ‘Excalibur dehydrator’. It’s a small fan keeping the temp of food constant over a period of hours so that the water dries off of the food without it spoiling. I’m an ardent fan of tea! So refreshing & delightful! This dish would go great with a nice cup of cold iced tea. Great combination of nuts and druid fruits ! I use usually in the morning for more energy. Healthy and very helpful snack. I practice because their nutrition benefit, here is some more info in this link http://www.healthyfoodbenefit.com/nuts-proven-to-prolong-life-more-than-17/ ; there you will know why you must try this recipe from Gena. Thank you for this delicious recipe. What is the calorie count and actual serving size ? I’m afraid I haven’t calculated that information for this recipe, Cat, but I’d say about 1/3 cup is a good serving size.